Click Here to Order"Greatest Hits: Sight & Sound (UK Release)"! As well as being recognised as one of the most influential bands of their generation, since they formed 30 years ago Blondie have become one of the most commercially successful acts to emerge from the punk and new wave scene of the late 1970s. Their musical influence spreads far and wide and is as evident today as ever before. 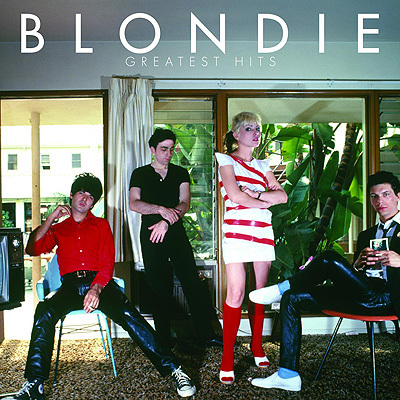 Featuring every classic track from their outstanding career 'GREATEST HITS' SIGHT & SOUND CD/DVD is a superlative collection of Blondie's finest moments and includes a staggering six Number 1s, two number 2s, three top 10s and four top 20 hit singles. Opening with their cross-Atlantic chart topper Heart Of Glass and featuring UK number 1s Hanging On The Telephone and the stunning Atomic, the album charts their astounding success from the mid1970s through to the late 90s when they stormed back to the top spot with amazing comeback single Maria. The DVD features the accompanying single videos, available together for the first time ever. Mostly made between 1977 and 1982 when the format was in its infancy, the collection stands as a testament to Blondie's groundbreaking status. Most bands were relying on live performances to sell their singles on television at that time, yet with videos such as Denis and The Tide Is High they created images that have become truly iconic over the years. 'GREATEST HITS' SIGHT & SOUND also features Rapture Riders as a bonus track. Created as a bootleg mash-up by acclaimed club remixer Mark Vidler's Go Home Productions (www.gohomeproductions.co.uk), the track, which combines Blondie's 1980 hit Rapture and The Doors' Riders On The Storm, quickly became an internet phenomenon and spread through dance clubs and onto commercial US radio. A new video clip of the track will also debut shortly. Note: This is a U.K. release. You can order it from Amazon UK. A U.S. version is also available (order from Amazon US or watch samples from the DVD).